Recently, an issue was discovered with some unlocked Windows Phones, in which MMS would not work if a new SIM was placed into the phone. For some reason, Microsoft did not provide functionality that would allow for automatic (there are some exceptions) or manual reconfiguration of Windows Phones MMS settings. This has led some industrious programmer to provide a homebrew solution to configure the MMS settings for your device. 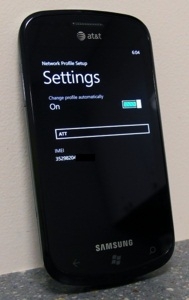 To use the program you will however have to jailbreak your device using ChevronWP7. If any of you have run into this issue or decide to jailbreak and use the app please share your experiences with us. It is ludicrous that early adopters need to rely on "volunteers" and jailbreaking in order to be able to use their phone. Surely this is not a good publicity for the new OS. I agree that this is an important issue to fix... but is this really that big a deal? How many people are swapping SIM cards in and out of a phone? How many users are buying Windows Phones unlocked? I suspect that those who are willing to buy their phones unlocked will also be those most likely to apply this kind of fix. It depends: in the US not many people buy unlocked devices; in the rest of the World a lot. Rechargeable SIM cards are very popular in Europe and people swap them from carrier to carrier depending by the ongoing deals offered. And again the biggest issue is perception: I would be very upset if I paid €500 for a device and discover that I cannot use in its full potential. I do not understand why it is so complicated for MS to state something about a coming fix for it. Point well made. Microsoft should have included this from the get go.